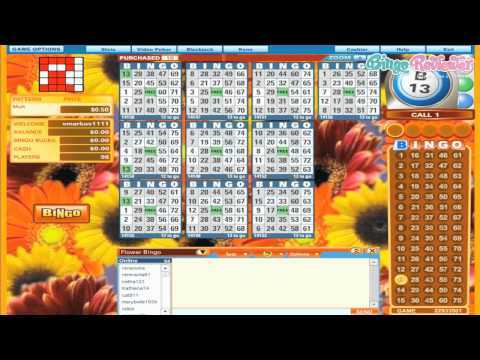 Instant Bingo is a sister site to Bingo Hall, Bingo for Money, Vic’s, Bingo Canada and South Beach Bingo. Each brand is essentially the same with a different web design. With that said, players are allowed to have one account at each site. While it has been a popular choice among US players it may not be the first choice for bingo players in the rest of the world. They specialize in 75-ball bingo games and offers Slots on a multi-software platform. 90-ball bingo fans are out of the luck with Instant as they focus on 75-ball variations across all rooms. For something a bit more lax, enter the Taboo Room in the evening hours. General ticket prices vary and can be found as low as 5 cents. The numbers games continue with Keno. Slots: Alkemor’s Tower, Crazy Jungle, Pinocchio, Diablo 13, Glorious Rome, Super 7’s, Rainforest Riches, 7’s Ablaze, Dice and Fire, SugarPop, Slot Dunk, Carnival of Venice, Tales of Egypt, Happy Circus, Reel Gangsters, Lotto Mania, Bee Land, Graveyard Shift, Merry Bells, Sugar Rush, Great Reed, Mad Orchestra and many more. Pull Tabs: Alien Encounter, Alleycat, Bank Heist, Gold Rush, Hole in One, Monster Bucks, Money Hog, Jungle Safari, Pirate’s Cove, The Ol’ West. New players are enticed with a lucrative Welcome Bonus when making their first deposit. The promotions continue all month long with Slot Tournaments, raffles, jackpot games, chat games, blackout games and much more. Check the promotions page for the latest daily, weekly and monthly offers. The VIP program offers a variety of benefits. With 6 levels of status, Basic, Rookie, Steel, Bronze, Silver and Gold, your cashout limit will depend on your VIP status. We give Instant Bingo 2.5 Pink Hearts based on a few issues with their customer service. Live Help representative are often lacking knowledge or they’re just plain rude to players. It’s is important to note that payouts have not been a common problem among players so this is still a fair option for bingo players, especially those in the US. When cashing out, you’ll also notice that you’re required to contact support to make your request. This isn’t an ideal situation and can make the process much longer than it needs to be. Instant Bingo is a great name for this site. Where else would you want to go when you want to play bingo and you want to play NOW? You'll get your bingo fix satisfied here from the moment you sign up with your free $25 bonus just for registering. Start winning with $1, 25cent, 10cent, 5cent and penny games. Deposit to gain massive bonuses and build your loyalty level up to receive even more. Play special games and try to win progressive jackpots. Try your luck with Bingo, slots, casino games, poker and all of the other fun offered at Instant bingo. They have some of the best chat hosts out there and are always offering fun chat games with their friendly hosts passing out the bbs to all players. You can win big cash prizes in their monthly tournaments. Watch yourself rise to the top of the leaderboard and be the winner for the month! Catch up with the new promotions by reading their newsletter that is filled with all you need to know to be a smart bingo player and max your bankroll when you win some of the huge prizes available. All in all a very fun site! There are a couple of things I like about this site and a couple of things I was a bit disappointed with. First of all, one of the first things that caught my eye was the lack of color and personality in terms of their layout. It is very plain and boring and it doesn’t exactly make me want to drop everything and sign up to the site. However, I always keep in the back of my mind that you shouldn’t always judge a book by its cover. What prompted me to really want to join this site was their appealing welcome offer. They give you a $25 bonus as soon as you sign up, with no deposit required. You can’t really go wrong with that. I figured there was no harm in virtually trying out a few of their games for free. I came to find that they have a wide gaming selection and, to top it all off, they offer live support, making it much easier to solve any issues you may come across. To start with $25 No Deposit Bonus, and then 500% first deposit bonus and a 350% second deposit bonus and a 250% third deposit bonus, and you have my attention. It is a great Parlay site, no downloads required. The site looks good, no boring graphics and banners, and the navigation is fast. They have 75 and 90 ball games, and that is rather standard. The schedule is a bit confusing, and it took me a while to catch it all up, but there'a a lot of things going on, so it does pay out to invest a bit of time. The support is great and I was very happy to see they can solve any issue in no time. Although there is no free bingo, there are some penny games you can get, and that's good enough for me. They also have interesting tournaments with good prizes. The VIP program is good, where you can collect stars, and the bonuses go up with your VIP level.